The Arts Of Wau Bulan is an artistic kites are rarely widely introduced to other communities, but on this day Wau Bulan Arts have begun to rise again in even introduced to the fans kites world-class arts of Wau Bulan article may be this month to breathe new and information useful to others. I post on this week is about the unique art Wau Bulan (moon kite) is implied. 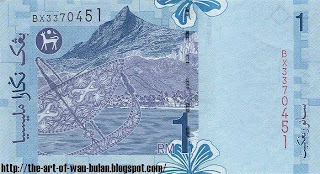 Do you all know that Wau Bulan (moon kite) is not only a game and also artistic heritage treasure the Malay race but Wau Bulan (moon kite) also display the Paper Money Malaysia ringgit currency, which is a daily use Rakyat Malaysia. Before this I never told you all symbol Wau Bulan (moon kite) etched on a coin 50 cents. For fans Wau Bulan (moon kite) you can also make money as a collection of personal papers of high value. 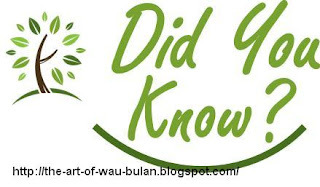 If we see the art, the body of Wau Bulan (moon kite) have patterns carved leaves and flowers. In fact, this simply proves that the art Wau Bulan (moon kite) is a high heritage value. So, we Malaysians must value the quality of care and pride. So if you are a collector collection Wau Bulan (moon kite) quickly get RM 1 (Malaysian Ringgit One) and promote the latest collection from you. I love great art, especially in the field of traditional arts, calligraphy, heritage, paintings, abstract and everything related to the art world. Because art can actually give peace of mind and past returns history.